Why Should I Nurse My Baby? Breastfeeding: You Can Do It! You can LOOK INSIDE by going to individual product pages! • English and Spanish in every book. • Helpful tips for parents. Want to purchase a smaller quantity to stock a classroom or library? Go to our Educator Sets page for more options. 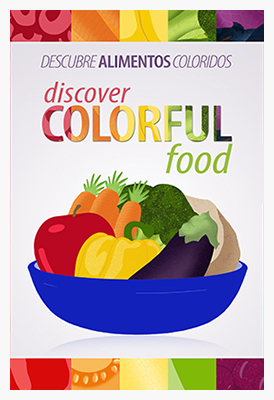 Discover Colorful Food is an illustrated book that teaches kids to recognize and name 8 colors and a variety of fruits and vegetables. NEW FLAT PRICING of 99¢ per book. 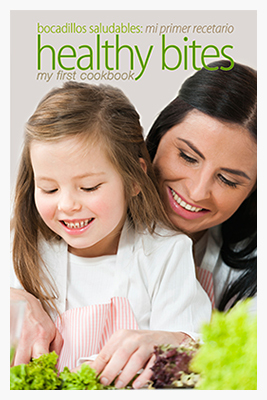 Healthy Bites contains 8 easy snack ideas for a parent and child to make together using 18 common ingredients, almost all WIC approved. This photobook for kids encourages exercise through active play. 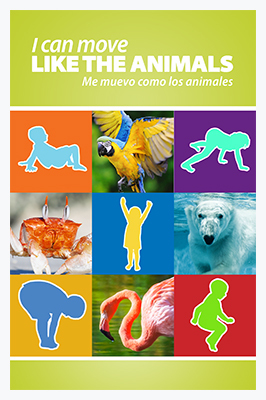 Parents and kids have fun learning to move like the animals. This photobook for kids encourages exercise through active play. 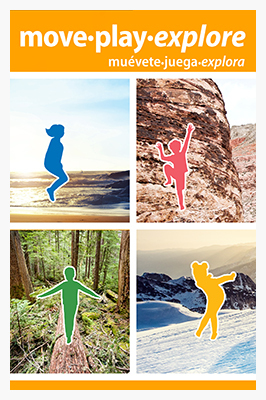 Parents and kids have fun learning to move like explorers. 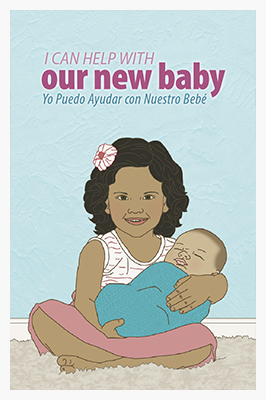 I Can Help with Our New Baby is an illustrated poem book showing kids the fun ways they can welcome and help with a new baby. 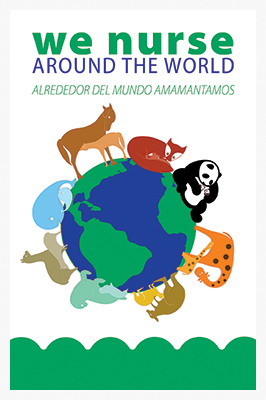 This illustrated book shows nursing mammals from every continent and the ocean, and moms and babies from around the world. 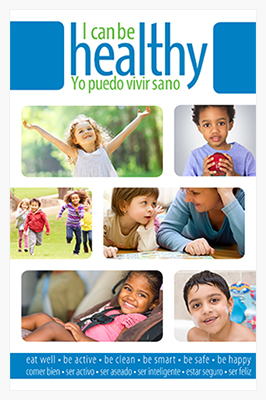 I Can Be Healthy is a picture book featuring 25 photos of kids making safe, healthy and smart choices. 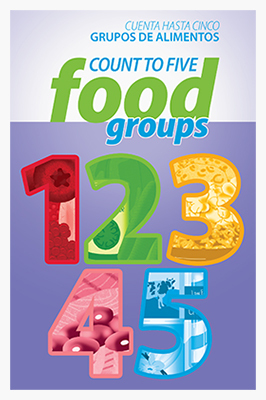 Count to Five Food Groups is an illustrated book that teaches kids to count to 5 and identify a variety of foods in each food group. 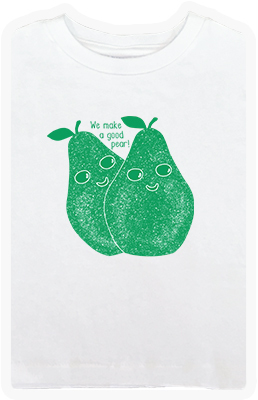 Celebrate colorful foods with these 4 adorable shirts featuring our favorite fruits! Also available in berry, grape, and orange designs. Bulk pricing starts at $10 per t-shirt. 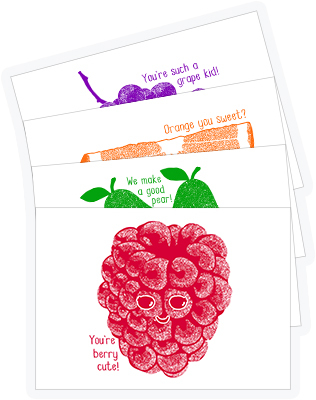 These adorable fruit designs are now available as 5”x7” prints on laminated card stock. Perfect for note cards or framed art for the office or a child’s room. Bulk pricing starts at 40¢ per card. *If you would like to order 10,000 or more of our kids’s books, call 800.397.5833 for shipping charges or for a custom quote. See you at the NWA Conference in Los Angeles! Win Prizes at the NWA Conference! • Why Should I Nurse My Baby? • Breastfeeding: You Can Do It!